I spent a semester during my Junior year of high school at a boarding school in the countryside of South Africa. It is a beautiful country with a vibrant cultural heritage. Yesterday, God called one of South Africa’s proudest sons home, Nelson Mandela, and I thought it would be apropos to celebrate the ways in which his life illustrated God’s idiot forgiveness. Mandela was a political activist in South Africa under the brutal and repressive Apartheid system. Apartheid was a system of government largely run by the Afrikaners (descendants of the German and Dutch colonists of the area) which functioned by repressing all native Africans in several ways, including the denial of any political office or voting rights, the invasion into and eviction from their homes and exile into townships such as Soweto. In the 1960s, Mandela and his comrades in the ANC (African National Congress) fought back with admittedly questionable means. Mandela was eventually arrested and sentenced to life in prison for sabotage, bombings, and inciting violence. Apartheid only grew more oppressive during Mandela’s time in prison on Robben Island. The police brutally cracked down on demonstrations by slaughtering hundreds of protesters. Mandela’s wife, Winnie, was taken away from their daughters in the middle of the night and held for eighteen months. But it was in 1990, after mounting political pressure, when Mandela was finally released, and showed the world the beauty of upside-down leadership. Racial tensions were incredibly high and the Afrikaners were terrified by the idea of the “one person = one vote” democracy that Mandela was fighting for. They knew they would be outvoted in such a system and feared for their safety. They feared for good reason. Many native South Africans wanted retribution against the Afrikaners for the years of injustice and abuse they imposed. Mandela had a different message. It was an offensive message, and one that very few wanted to accept. “Forgive them,” Mandela implored. The same people who imprisoned you for twenty-seven years, the same people who terrorized your people for decades, who broke apart your family and countless others. Forgive those people. The question was posed the other day in a bible study of, “How was Jesus such a loving figure, yet so many people wanted to kill him?” I think one of the answers to this question is shown through Mandela’s life. Many people hated Mandela and his call for forgiveness, just like they hated Jesus’ message of forgiveness because it is an offense to any idea of justice, and prevents what “should” happen from happening. It seems idiotic. Despite the unpopularity of his calls for forgiveness, Mandela was elected President in 1994 when everybody in South Africa was given the right to vote, regardless of race. He continued his calls for forgiveness and even hired body guards who had served as police and who probably perpetrated some of the violence in the townships. 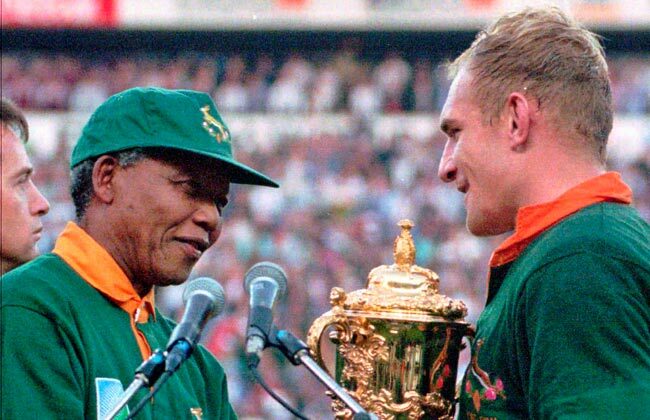 He enthusiastically supported the South African Rugby Team during their win in the 1995 Rugby World Cup, even though most of the team were Afrikaners and the team stood as yet another symbol of Apartheid. So much of what Mandela did was done in the spirit of forgiveness. It was offensive. It was idiotic. But it was beautiful because it’s the same love and forgiveness that Christ shows us every day. So thank you Madiba. Thank you for your leadership, your love, your forgiveness, and your example. P.S. If you didn’t already know, The Onion has a way of taking sad moments like these, and making brilliant humor. Thank you for this. I have heard from several evangelical friends that he was a brutal, godless man, but your story seems to indicate something different. Thank you for the perspective. I am no expert on Nelson Mandela but there appears to be some ambiguity as to Mandela’s pacifism. “Although initially committed to non-violent protest, he co-founded the militant Umkhonto we Sizwe (MK) in 1961 in association with the South African Communist Party, leading a sabotage campaign against the apartheid government.” – http://en.wikipedia.org/wiki/Nelson_Mandela Does anyone know more details about Mandela’s relationship with MK? Nelson Mandela Got A Sports Trophy!